Prototype radar scanners that can detect weapons concealed on people in public spaces is set to undergo real-world testing next year. The device, developed by a team at Manchester Metropolitan University, could boost security at airports, transport hubs and major events. It is designed to scan individuals in a crowd at a distance of up to 25m. 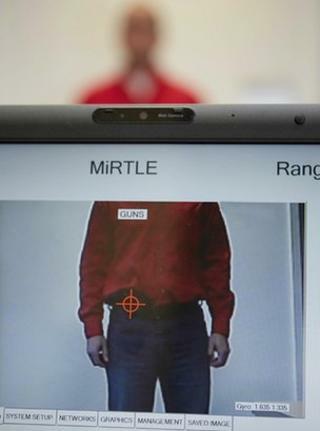 The scanner uses low-power, millimetre-wave radar signals that reflect off a weapon and back to the scanner. The designers say their system should help security officials combat a wide range of threats, from hidden handguns and knives through to people wearing explosive vests. An in-built computer determines the presence of dangerous objects and alerts the operator within seconds of detection. Built-in artificial intelligence (AI) differentiates between common items such as keys, belt buckles or mobile telephones and those that present an immediate threat to safety. The devices come in two forms. The first is as a mobile system that could be carried in a public space; it has a range of 7-10m. The second is a larger, static version that has an extended range of 20-25m and could be deployed at checkpoints or be mounted on vehicles. The team behind the prototypes stresses that the scans will neither compromise people's privacy nor their health. Unlike airport scanners, the devices do not produce an image of the subject but only analyse radar signals reflected from an individual. Prof Nick Bowring, head of the centre for sensing and imaging at MMU, said: "The beam of millimetre-waves are reflected back from the target, containing information about the target. Those waves are interpreted by a computer, which looks at the pattern of the returns and compares them against previous detections, such as a person carrying a threat item. "It's really a combination of a radar system and an AI-based computer system. It would have been unthinkable to make it just five years ago because the computing power and hardware were just not there." He added that the radar waves were harmless: "Typically we use a thousandth of the power of a mobile phone," Prof Bowring explained. The prototypes, nicknamed MIRTLE and MIRLIN, are being turned into commercial versions and will be ready for use in Spring 2014. The university said that customers were already lined up to test the scanners. "We have significant interest around the world, in particular from the US, UK and the Middle East," said Douglas Dundonald, from Radio Physics Solutions, which has signed a commercial agreement with MMU. Civil liberties groups have previously called for scrutiny of such technology, whilst urging policy makers to focus on the causes of violence. Prof Bowring started to develop the system in 2004 and the MMU team refined the technique after initial funding from the Engineering and Physical Sciences Research Council (EPSRC), the Metropolitan Police and the Home Office Scientific Development Branch.